Inquiry: Read an article in today’s NYT about Situin and it’s potential in preventing Alzheimer’s. Resveratrol was mentioned as promoting Sirtuin but the article was not clear if it did so past the brain/blood barrier. I would appreciate if you could shed some light on this. Comment: First, I am obligated to say that at no time in my answer below am I suggesting any resveratrol-based dietary supplement is proven for the cure for a brain disorder like Alzheimer’s disease. It can only be said it is a very promising molecule in regard to aging in the brain. Second, resveratrol pills have been marketed avidly in the U.S. now for about 6 years and we simply haven’t received reports from patients or families of Alzheimer’s patients that any resveratrol pill restored memory, though we do frequently receive reports from healthy individuals that they experience improved mental alertness and clarity of thinking and that their recall (memory) is a lot faster. Third, yes, resveratrol does pass the protective blood-brain barrier as it is a small molecule (this will be elaborated upon below). However, resveratrol traverses the blood circulation complexed with glucuronate or sulfate, two detoxification molecules that attach to resveratrol as it passes through the liver, temporarily rendering resveratrol as a non-bioavailable molecule (can’t pass through cell walls attached to these other molecules). However, an unlocking enzyme, glucuronidase, which is 16 times more abundant at sites of inflammation, infection and malignancy, frees resveratrol as an unbound molecule, which is nature’s drug delivery system. Metabolism of resveratrol in the liver also prolongs the half-life of resveratrol from ~14 minutes to 9 hours. Third, what is reported in The New York Times by Nicholas Wade, whose articles about SIRTRIS pharmaceuticals over the past six years have been quite popular, appears to be a defense of Sirtuin1 gene activating drugs. Sirtris’ SRT501 botanical-based stabilized, emulsified, micronized resveratrol pill has come under fire with the recent discovery a fluorescent compound in the gene activation test was responsible for the Sirtuin1 activation, not resveratrol. This doesn’t diminish the promise of resveratrol, but it does cast a cloud over its intended gene target. Nicholas Wade’s article (Potential Found In New Approach to Alzheimer’s) emanates from a newly published report in Cell (Volume 142, Issue 2, pages 320-32, July 23, 2010), which can be viewed online here (click the tabs to view all the parts of the report). The title of the report is “SIRT1 Suppresses β-Amyloid Production by Activating the α-Secretase Gene ADAM10.” (Interpretation: A gene called Sirtuin1and its proteins inhibit the formation of beta-amyloid plaque via the activation of an enzyme, alpha secretase — plaque that is implicated in the onset of memory loss typically seen in Alzheimer’s disease. 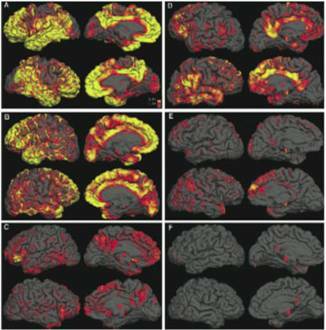 You can visualize beta amyloid accumulation in the brain in the PET scan images presented below. The PET scans revealed beta-amyloid plaque in the brains of three Alzheimer’s disease patients (left) and three normal controls (right). The yellow indicates high uptake of a label that targets beta-amyloid plaque, and the red indicates medium uptake. A problem with this study is that overproduction of beta amyloid plaque is not the primary problem in the aged brain. The problem is the inability to get rid of beta amyloid. It hardens and becomes a toxic form of plaque. This is believed to be due to the accumulation of copper and other heavy metals in the brain over time. Very small amounts of inorganic copper (not bound to a protein) in tap water, 10-times less than what the Environmental Protection Agency allows, inhibits the efflux (removal) of beta amyloid. What researcher George Brewer at the Departments of Human Genetics and Internal Medicine, University of Michigan Medical School, points out is that inorganic copper, iron and other heavy metals, largely acquired from drinking water and vitamin supplements, hardens the beta amyloid plaque and inhibits the efflux of beta amyloid from the brain. Resveratrol, being a copper chelator, is certainly a potential antidote in this regard. However, unbound iron is also a problem and resveratrol does not chelate (key-late) iron. The addition of an iron chelator such as quercetin or IP6 would be desirable in this regard. If you attempt to upregulate Sirtuin 1 but fail to stop the intake or inorganic copper, what have you accomplished? As an aside, it is interesting to note that Alzheimer’s is a disease largely exhibited in advanced civilizations that rely upon copper plumbing. More primitive cultures do not exhibit Alzheimer’s among their aged. Gene expression: cause or consequence? It is important to understand the workings of epigenetics here in contrast to structural genetics (gene sequencing, mutation, etc). The science of epigenetics, in contrast to gene structure that was discovered by Charles Crick and Francis Watson in 1953, is that gene protein-making is governed by environmental factors such as food, lack of food, radiation exposure (sunlight), and temperature. Small molecules known to activate the same genes as a calorie restricted diet, for example, would serve as an example of molecular medicine, a short-cut where these environmental factors are mimicked. However, if the environmental factor (i.e. copper accumulation) continues, it may override any gene activator. Another problem with this research is that while over-activation of Sirtuin1 gene protein (SIR2 in animals) may be beneficial in the brain, it may be deleterious in other organs, such as the heart. Furthermore, Leonard Guarente, MIT professor, the lead researcher in this study presented in the New York Times, conducted research which shows that calorie restriction (CR), the unequivocal dietary practice that doubles lifespan of all living organisms tested, does not universally differentiate the Sirtuin1 gene in all tissues and organs. Therefore, stimulation of this gene cannot be used as a gauge of whether a molecule like resveratrol is a mimic of a CR diet. Since Alzheimer’s disease and aging itself involve many genes, a gene array study may be revealing. Resveratrol is a small molecule (228 Daltons molecular weight), so it passes the blood-brain barrier, and through cell walls, where it influences genetic machinery indirectly via the FOXO1 gene in the cytoplasm or directly in the nucleus. This is in contrast to other Sirtuin-activating drugs (SRT1720, SRT 1460, SRT2183) which are larger molecules and unable to traverse the blood-brain barrier. The glory of resveratrol and other small molecules like it is it regulates many genes, not just one. 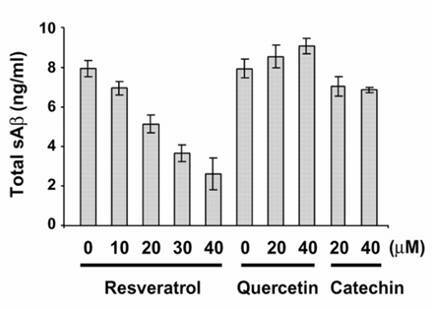 There is also synergism noted when multiple small molecules like quercetin are employed with resveratrol. A more profound genomic effect, 6-fold greater than plain resveratrol and 21 times greater than a calorie-restricted diet, was produced by a resveratrol-based nutriceutical matrix (Longevinex®). While it is true that very low nanomolar concentrations (parts per million) of resveratrol have been shown to reduce beta amyloid plaque in the brain of animals, Alzheimer’s disease involves many factors, not just a single gene, nor just beta amyloid plaque. Some people have a lot of brain tangles and beta amyloid and experience no loss of memory in their retirement years. It is clear that many factors (poor circulation, gene expression, heavy metals (particularly iron, copper, lead, mercury, aluminum, manganese), chronic viral infection, lack of thiamin (vitamin B1) which is often caused by over-consumption of sugar or alcohol, may be involved and any proposed therapy will have to address multiple etiologies. Chronic inflammation is a hallmark of aging and what has been termed “inflammaging” is believed to be central to the onset of Alzheimer’s disease. 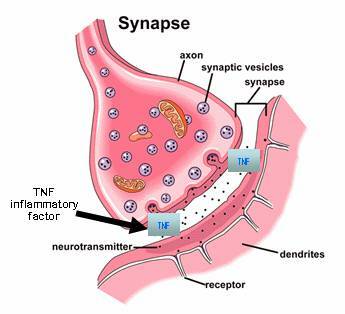 This is likely due to the unequivocal fact that chronic brain inflammation, as evidenced by an inflammator agent (cytokine) known as tumor necrosis factor (TNF), interrupts transmission of brain chemicals across the synapse (gap) between brain cells (neurons). The injection of a TNF-inhibiting drug (etanercept) directly into the brain via a neck vein has been demonstrated to produce almost immediate memory repair in humans, but the effect only lasts about 6 days and costs ~$10,000 to $40,000 a year. While unaffordable and impractical, this does tell us that neurons are intact and inflammation plays a strong role in brain deterioration. Of interest to readers here, resveratrol, quercetin, and vitamin D3, ingredients in Longevinex®, are strong TNF-inhibitors. However, it should be noted that over-inhibition of TNF is potentially deleterious as it stunts the immune system and drastically elevates the risk for leukemia (cancer of the blood) and lymphoma as well as tuberculosis (lung infection). This suggests modest dosage, which is what Longevinex® provides (100 mg resveratrol). Over-dosage may be why mice on high-dose resveratrol (365 and 1565 milligrams, human equivalent dose) experienced a shortened life span and mostly succumbed to lymphoma. While experiments like these gain much attention in the news media, they don’t help to explain why humans age at different rates. Aging is not a shortage of Sirtuin1 protein per se, as researchers may mislead us into believing. We may or may not have been producing a lot of Sirtuin1 protein in brain tissues when we were young and our brains were working well. I maintain the rate of aging is controlled by the accumulation of minerals. There are three speeds of human aging: (a) no significant biological aging in the growing years, as evidenced by a lack of lipofuscin (cellular debris) formation; (b) progressive aging once childhood growth is completed in males or menopause is approached by females, resulting in accumulation of minerals, largely calcium, copper and iron, which “rusts and calcifies” tissues and organs, resulting in dysfunctional lysosomes and mitochondria; (c) a third stage of aging where the rate of aging subsides, which has been correlated with reaching a steady-state of iron (ferritin). There is no other explanation given as to why humans age at three different speeds. It is the minerals that then switch the genes.